I’m happy to take inspiration where I find it, and the Kale Waldorf Salad that I sampled the other day at Trader Joe’s was quite good. I took one home to try and ended up copying it in my own way. Despite being billed as a kale salad, the TJ’s version has mostly spinach with just a little chopped kale. Mine has a higher proportion of kale. I prefer to rip the central rib out of each leaf of kale when I’m using it in a raw salad so that’s what I did here. 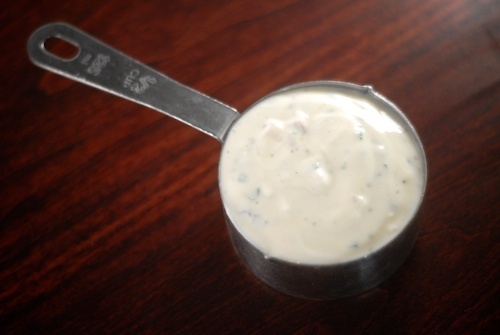 I’ve made this with a Greek yogurt honey dressing, or alternatively, with a non-dairy yogurt dressing. Choose either one according to your needs. 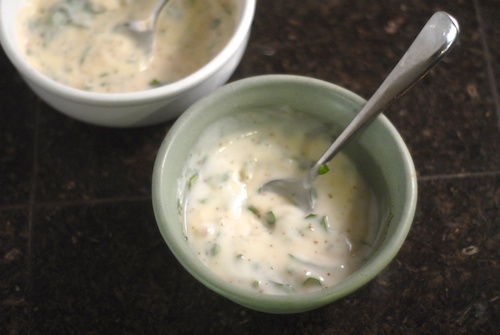 My recipe-formatting program won’t let me put in more than one recipe per post, so the recipe for the Greek yogurt honey dressing is here, and the non-dairy yogurt dressing is here. 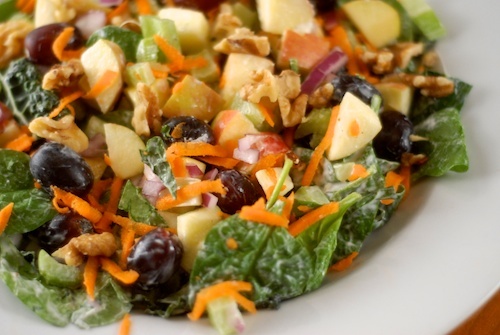 A kale waldorf salad, dressed with either Greek yogurt honey dressing or a non-dairy yogurt honey dressing, your choice. 1 extra small carrot, grated or peeled into long strips with a vegetable peeler. If you are using a bunch of spinach, wash it in several changes of water. If you are using bagged spinach, just wash it once or skip this step. Spin dry spinach and kale. Rip each leaf of kale away from the rib to remove the tough center section. This is optional, but I prefer to do it, especially with some types of kale that have a larger central rib within the leaf. Chop the kale into bite-sized pieces. Toss spinach, kale, and about half the recipe of dressing in a large bowl. Toss remaining ingredients except carrots in a bowl with the remainder of the dressing. Top greens with the dressed ingredients. Top with shredded or grated carrot. Recipe provides three full-plate portions of salad. Non-Dairy Yogurt Honey Dressing A honey yogurt dressing made with non-dairy yogurt (coconut milk yogurt or almond milk yogurt). 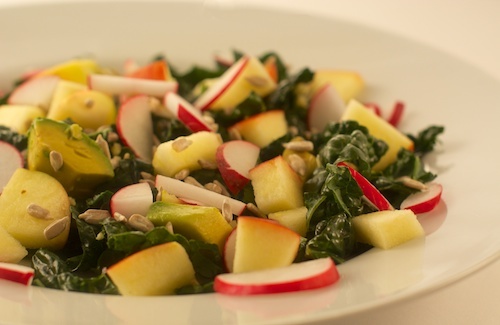 Rockin’ Raw Salad with Kale, Apple, Radish, Avocado and Ginger Honey Lemon Kale salad with gingery honey lemon dressing, apple, avocado, sunflower seeds and spring radishes. I am constantly looking for great kale recipes – what a great idea to do this riff on a Waldorf. Your Greek honey yogurt dressing looks great too!! 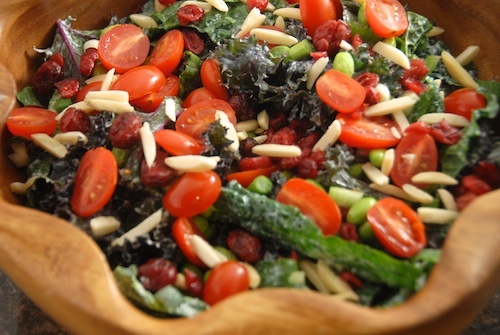 What a great use for your Greek yogurt dressing in this salad! It looks so fresh and pretty, and I bet it tasted wonderful. How utterly delicious Mary! I love that you recreated it! Looks delicious! Totally need to try this. This looks really delicious. I just purchased some lemon-white balsamic vinegar and it feels like a light lemon vinaigrette with good olive oil would be a nice non-creamy dressing. What do you think, have you tried this with any other dressings? I just found your blog (you left a comment for me on mine, thanks!). Keep up the skating and cooking! Thanks, Beth! I think lemon, balsamic, and olive oil are all good on kale or spinach but I don’t like olive oil on fruit, I would choose a neutral oil like grapeseed or canola (if you use canola). Thanks for the visit and the encouragement! That does sound really good! I love salads with lots of fun add ins, which this definitely has! Jane recently posted..Lilla Rose Hair Jewelry – Review and Giveaway! I like your version better. I love spinach, but LOVE kale! Now that I can get vegan Greek yogurt, I’ve been using it on and in everything. This sounds like a perfect recipe to continue that trend. 😉 I’m not a fan of mayo-based salads, so this would be an excellent departure from the original. Cool, now I see your review of So Delicious Coconut Greek yogurt, and see that you’ve used it in a number of recipes since your review. I’m sure it must be at my co-op which seems to have a really extensive collection of yogurts. I’ll have to give it a try, I used regular coconut yogurt for one of my non-dairy versions, Greek-style would likely be even better. I love creating my own versions of prepared foods or restaurant meals, too. Both dressing sound really tasty. Love the pic! I love waldorf salad. This looks wonderful! I love trader joes! This looks so yummmy!